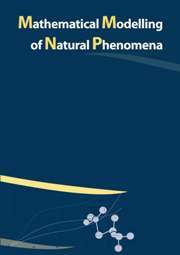 Mathematical Modelling of Natural Phenomena (MMNP) is an international research journal, which publishes top-level original and review papers, short communications and proceedings on mathematical modelling in biology, medicine, chemistry, physics, and other areas. The journal is essentially functioning on the basis of topical issues representing active areas of research. Each topical issue has its own editorial board. The authors are invited to submit papers to the announced issues or to suggest new issues. The journal publishes research articles and reviews within the whole field of mathematical modelling, and it will continue to provide information on the latest trends and developments in this ever-expanding subject.